This is not my 10 “best” books list, nor am I suggesting these are “must reads” for everyone (though they are all great books), but they may help you rethink the Bible. These are books that crossed my path 20-25 years ago, mainly while in graduate school, that influenced my thinking in new and heretofore largely unexplored directions, and so opened my eyes to the larger world of the Old Testament, where it came from, and what it means to read it well. The first 6 books are from 4 of my Harvard professors, which speaks to their formative influence. Using the story of Joseph, Kugel lays out the dynamic world of biblical interpretation in the Second Temple and later rabbinic periods, the creative nature of midrash, and biblical “irritants” that drove early Jewish interpreters to do what they did with the biblical text as an expression of expectant reverence for their scriptural tradition. This book also helped me to begin seeing echoes of early Jewish midrash in the New Testament’s likewise midrashic, creative handling use of the Old Testament. A massive compendium of interpretive traditions on the Pentateuch in Second Temple Judaism. The documented breadth of how Jews and Christians in antiquity read the Hebrew Bible/Old Testament is staggering, and alerted me to the flexibility and legitimate interpretive possibilities of biblical interpretation–and how seeking “one meaning” is not only a specious undertaking, but boarders on disrespect for the very nature of scripture. Levenson has written, this is a model of blending together historical critical scholarship and one’s theological tradition and was part of my early motivation for seeking similar possibilities for Christian theology. Responding to lapses (i.e., latent anti-Semitcism) in Christian biblical theology, Levenson articulates a distinctly Jewish biblical theology focusing on the very elements of the Hebrew Bible neglected (or vilified) in Christian theology but that are central to the Hebrew Bible: law and temple, represented by two mountains, Sinai and Zion. Seeing biblical theology done wholly apart from the categories I was accustomed to was a reorienting experience and challenged my assumed privileging of a Christian (Protestant) reading of the Old Testament. The Mosaic Law (form) was given in conjunction with Israel’s liberation from slavery and was a mark of freedom and a covenant bond with God. Over time it became institutionalized to mere ritual and subject to prophetic critique (reform). This form/reform pattern in the Old Testament models the means by which a continued deep fidelity to the heart of any faith tradition can be sustained. The Bible, therefore, sets a precedent for the continued need for the church to reflect on and reform tradition when called for. My introduction to the seeing the Old Testament as part of its larger ancient environment. The origin(s) of Israelite religion is (are) continuous with the Canaanite culture from which it emerged. But rather than expressing its own origins through Canaanite myth, Israel’s record is best referred to as an “epic,” which is an interpretation of historical events by means of mythic categories, thus resulting in a tension between the mythic and historical. The Hebrew Bible is not only the foundational document for the exegetical culture of Judaism and Christianity but an exegetical work in its own right. The Bible is a compendium of “innerbiblical exegesis,” a movement of recontextualizations of earlier material for different settings, where the authoritative text is both received and built upon, all of which continues to function as scripture. In fact, for the authoritative text to function authoritatively, it must be adapted to changing circumstances. For me, this was a big moment in seeing why the Bible looks so uneven and thus resists simple systematization–the Bible evinces growth and change. Bringing together the depth of both Christian and Jewish traditions, Anderson offers a remarkable exposition of the Adam and Eve story that leaves one staggering at its complexities and subtleties, and what Judaism and Christianity have creatively done with it. This formative story for both faiths is neither simple to understand nor monolithic in meaning, but rather invites imaginative exploration. Without returning to precritical naïveté, Brueggemann presents a post-critical critique of historical criticism’s claims of “objectivity” and unquestioned authority in biblical interpretation. The postmodernism shift recaptures the inevitability of local/contextual factors in accessing the Bible and the pluralistic interpretations that result (which is not dissimilar from the plurality of precritical and ancient modes of biblical interpretation). I stumbled on this book I know not how or why, but reading it was deeply affirming. Writing in 1892, Smyth lays out with honesty and pastoral care the challenges of modern biblical scholarship and the pressing need for Christians to come to terms with it, not to disquiet the church but to help those already disquieted. “These are not the days for Christian teachers to hold their peace and risk the faith of one-half of their people by humoring the mistaken views of the other half, through fear of disquieting them” (p. 2). At times dated, the book shows us that addressing constructively and proactively historical criticism is not a recent trend. Thanks for the list, Pete. Would you care to comment on “When God Spoke Greek”, by Timothy Law? It had a profound effect not only on my understanding of the origins of the Septuagint, but on the nature of inspiration and biblical texts in general. Search my blog. I did a piece on the book when it came out. And I agree! I like the interview with Law, but I’m curious about what you think about the book. Just finished reading James Dunn “The Living Word”. As I see it he has done a good job of expressing a reasonable position that I feel comfortable with. Comment? Hey Pete, I am a Master’s student right now, planning on pursuing a PhD in Hebrew Bible. As such, I am very much interested in reading these books. Do you have a suggested order in which to read them? Or which ones of these 10 do you think are the most important? None is more important than the others. It just depends on interest. I have and have read Kugel’s The Bible As It Was. The “scholarly” version (The Traditions of the Bible), with more notes, etc., that you cite in your list costs significantly more. What are your thoughts re: how much better Traditions of the Bible is than the condensed version? It gives a lot more detail/examples. Thanks Pete….I just finished “The Sin of Certainty” and found many symphonic chords ringing true with my own soul and life experiences. Regarding your 10 books above…even though I haven’t read any of them, I have read Marcus Borg’s “Reading the Bible Again for the First Time” and was deeply impressed. I found two Smyth books. One is How God Inspired the Bible: Thoughts for the Present Disquiet. The other is How We Got Our Bible. The first one may be what you have in mind: it is more pastoral. The second is more historical in focus, looking at manuscripts, for example. 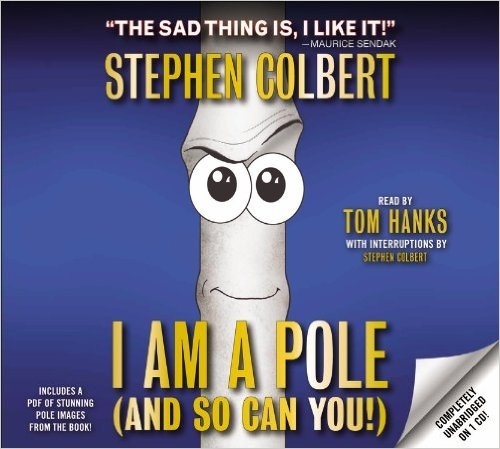 Has anyone picked up the Stephen Colbert reference?